A couple of weeks back, I finally decided to put my hat in the ring to become a Tech Field Day delegate. For those who don’t know, Tech Field Day is a set of events hosted by Stephen Foskett and his team, where technology vendors get together with techies/bloggers/engineers of their field and have focussed discussions around their products and why they’ve produced the best product for their customers. The sessions are live and streamed to screens all over the world. I’ve always enjoyed the immensely interesting and candid discussions that happen in the 1 – 2 hour sessions per product. When I applied, I didn’t expect to receive a mail from Stephen a few hours later but I did indeed receive that mail and how could I have ever refused. I am honoured to be a first-time delegate and can’t wait to join the rest of the delegate family, which will be tomorrow. SoftNAS is fundamentally a storage company but focusses on cloud storage with their product, SoftNAS Cloud. SoftNAS Cloud allows organisations to host and control their data and applications in a multi-cloud environment. Their mission is to solve the biggest obstacles to cloud adoption including loss of data control, and the inability to fully integrate and utilize data. If you are a business already on or on your way to becoming a multi-cloud environment, management of data and applications can be a problem as all vendors have their own way of storing and securing data. Access control could also be quite cumbersome to understand, let alone master. SoftNAS is one solution that can simplify those issues by providing a uniform architecture, abstracting the need to understand all the intricacies of the host environment. Or you could be a cloud and/or storage enthusiast keen to remain up-to-date with interesting solutions to problems that your customers are facing or might come across on their way to becoming multi-cloud enabled. They don’t have any past sessions so there are no older links on the page yet but as videos of their sessions go out, this page will contain the links so that you can watch them later. Aviatrix is all about hybrid cloud networking. Their aim is to simply cloud networking for hybrid scenarios in a secure and scalable way. Aviatrix provides a software solution for all types of encrypted cloud connectivity: between enterprise datacenter and public cloud (hybrid cloud), between public cloud inter-regions, between different cloud providers (Amazon AWS, Microsoft Azure and Google Cloud Platform), and direct user access to public cloud through VPN. When talking about cloud connectivity, one of the most common hurdles is networking complexity. This is especially true for organisations where teams might have organically skilled themselves up with time. Most cloud concepts remain the same migrating workloads to the cloud but networking still proves to be more of a challenge and causes roadblocks. Aviatrix is solving this problem in interesting ways and it’s worth watching what they have to offer. They have present at Tech Field Day Extra before, links to which are in their company page (link below). Have a view to get a taster of what they might be showing this time. They presented at Tech Field Day Extra at Cisco Live US 2018 before so, by all means, have a look to get an introduction to their technology. LightStep wants to help developers identify and resolve issues quickly so that they can build and ship their products faster. Their product “LightStep [x]PM” is an application performance management platform that monitors and diagnoses anomalies in software behaviour almost instantly, whether it be web, mobile, traditional monolithic applications or microservices. Monitoring applications are getting smarter by using statistical models to calculate baselines for the various software they manage but a lot of implementations are still the evolution of traditional monitoring. This product uses open standards and various other open source tools to have a minimal footprint, just enough to send logging information to “Satellites”, where the data is sanitised and then sent to the SaaS-based LightStep Engine. Due to this lightness of the agent, it becomes suitable for even the smallest of implementations such as microservices. Seems like something very interesting to dig your teeth into, doesn’t it? Cohesity offers secondary data storage with scale and simplicity. Their mission is “to reinvent data infrastructure so IT can focus on serving the business rather than managing complexity”. In other words, they want to make storage simple to manage, regardless of which type of environment it serves. Cohesity has gained a lot of traction in the storage world in a very short space of time. That is because they’re one of the very few storage vendors who store various forms of data but also provide enhanced features like Analytics, Test/Dev platforms and instant mass restores etc. Integration with the most popular on-premises hypervisors and public clouds make it a very attractive option to start small and then grow as required. When starting with a multi-cloud strategy but implementation planned for the future, choosing the right storage system with most flexibility and future-proofing becomes the key factor. Having modular growth options with wide range of platform support make Cohesity a strong contender so knowing everything about it, won’t be a bad investment of time. Cohesity is already a veteran of Tech and Storage Field Days so feast on a long list of sessions already present on the company page. Let’s see what they add for Cloud Field Day 4. Veritas has been a strong presence in the backup world for a very long time. Their solutions cover backup and recovery, business continuity, software-defined storage and information governance. Veritas has a large portfolio of products so it’s hard to tell what they will present but given their refreshed outlook, I have a feeling that it will be about their multi-cloud data management product(s). With its pedigree, you can expect them to have all the bases covered for today’s multi-cloud data storage and protection landscape. So, I am interested in seeing what Veritas has to offer and how it compares with the offerings from the relatively newer outfits. Hope this post is useful and you will tune in to see all these vendors presenting and watching the interesting discussions that I love the most. 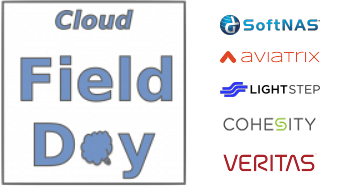 Don’t forget that on Twitter, the official hashtag is #CFD4 and the main page is: Cloud Field Day 4 so see you there! Disclaimer: As is customary for Tech Field Day delegates (and just in case), I would like to say that while Gestalt IT is paying for my travel, accommodation etc. to attend Cloud Field Day, I am not being paid or being asked to write anything either good or bad about any of the companies presenting at Cloud Field Day 4.